I arrived at Roade Village Hall bright and early to find a hive of activity in preparation for this L3 and L6 Trial. I had the pleasure of co-judging the L3 with Jennie Dean although we didn’t get much of a chance to have a chat because Jennie judged the outside searches for L3 while I stayed indoors. We had a quick lunch and then started the L6 which Jennie was competing in. L3 is quite a step up from L2 because, apart from the new scent of gun oil, the scented item doesn’t get taken out and it was interesting to see the handlers who brought their dogs out to reward and those who wanted to continue the search. Most dogs didn’t have a problem with the gun oil but some handlers didn’t give their dogs the opportunity to search items from both sides or, in the case of bigger items, approached from one end only. The perimeter items were set away from the wall and only one handler took her dog around the back of the items. On the perimeter the scent was clove and I placed it in the head of the vacuum cleaner. Many folk suggested their dog should consider the body of the vacuum but not many suggested the head which was a metre away from the body and therefore quite a few missed it. Notables here were Hazel & Skye who had a lovely indication, Jean & Nuala who worked her dog beautifully and Kim & Max who covered the area superbly. In the Bags and Boxes search Nicola’s Timber gave us a few minutes of amusement as he joyously ran around with a soft bag like a free spirit! Three times! Charlotte and Bea worked well together and found both scents in a super speedy time. Overall in L3, I saw some fine handling and super enthusiastic dogs who put in a good shift. By this level handlers are becoming much more observant of their dog’s body language which pays dividends. I’d like to thank Tig who did a great job scribing for me for L3. There were 12 competitors for the L6 Trial and I decided to start and finish with an interior search and do the exterior search in between. The hall is big and airy and there were many stacks of chairs at the around the stage and down the side of the hall. Of course, these have to be searched but both dogs and handlers make assumptions about where the scent will be hidden and many teams spent a lot of time searching chairs where there were no scents to be found. The trickiest hide was on the floor under a bit of slightly raised vinyl and this foxed quite a few of the teams. Outside was chilly with a bit of a breeze which swirled the scent around and caused it to collect in the corner of the building. However, the handlers showed their expertise at this level and covered the area with aplomb. Time was pressing on so I reduced the size of the last interior search much to the delight of the handlers. There were only three finds in this area and everyone got them. These teams are at the top end of the game. The skill of the handlers and the dogs’ understanding of the job they had to do was a pleasure to watch. 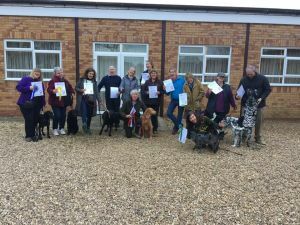 The high scores speak for themselves and everyone passed but many congratulations to Chris & Dilly for achieving Excellence and also to Karen & Reggie who were only split by time for the first two places. Thank you Becky for inviting me to judge this very well run Trial, to Rob for scribing the L6 for me and his efficiency at putting out the scents in good time so each search area was ready to move onto after the last one was finished. Thank you to those who contributed to the magnificent lunch and to everyone who entered both Trials, all of you came into the search areas with smiles and enthusiasm. Well done to you all. 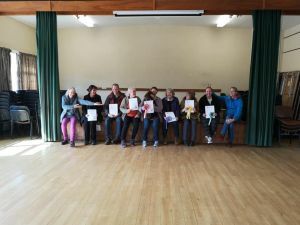 Roade Village Hall, Bailey Brooks Lane, Roade, Northants, NN7 2LS.